It's almost spring (in less than a week)! I already see clovers popping up everywhere, which means that St. Patrick's Day is near. 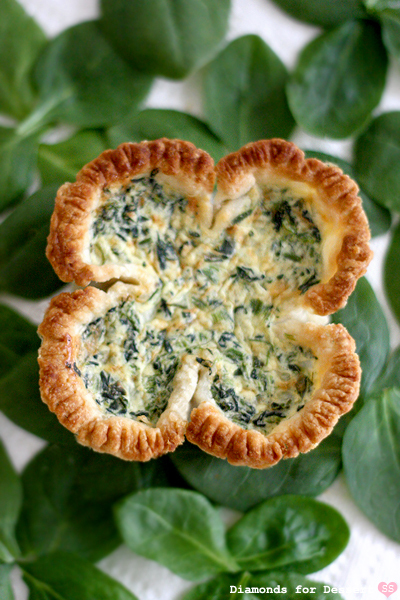 I wanted to make something green for St. Patrick's Day and finally settled on making spinach quiche. 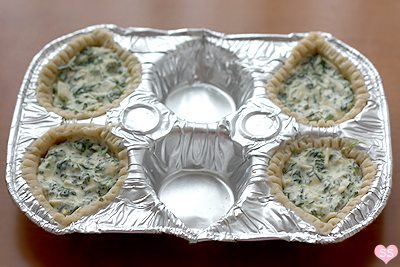 And for some extra luck, I decided to shape my quiches like 4-leaf clovers. I didn't want to buy a clover shaped pan, since I knew it'd get very little use and take up a lot of space. 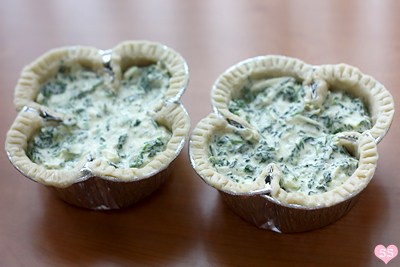 Instead, I did some brainstorming and came up with two different ways to make 4-leaf clover shaped quiches. 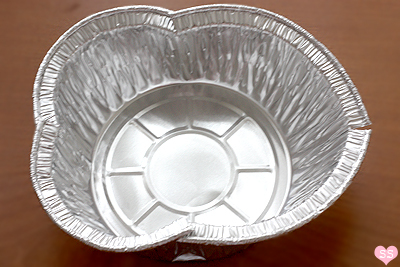 Both involve disposable aluminum pans, one a muffin pan and one a pot pie dish. So pick and choose depending on which method you like better. The great thing about this quiche recipe is that it's pretty adaptable in terms of ingredients. Overall, these would make a great treat at any springtime party. Mix the flour with the salt. 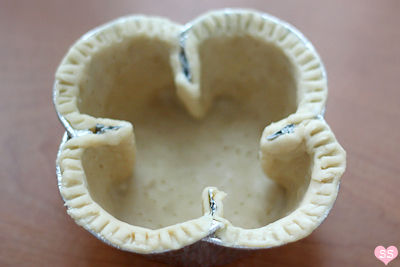 Cut the butter into the flour with a pastry cutter or your fingers until it resembles coarse meal. Add the ice water, a little at a time, while gently mixing until the dough sticks together. Split the dough in two. 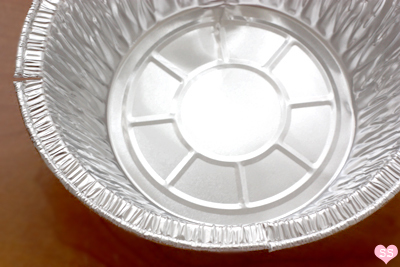 Place each half on a piece of plastic wrap and flatten each into a disc. Wrap the dough in the plastic wrap and refrigerate at least 1 hour, until ready to use. 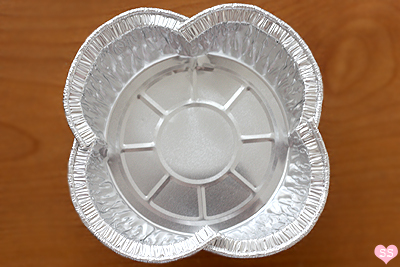 1) Take a pair of scissors and cut at four equally spaced points on the edge of the pot pie tin. One snip on the right, one on the left, one at the top, and one at the bottom. 2) Start pushing the cut edges towards one another. Crease the pan side, right under the cut, so that the crease points inwards. Be careful because the edges are sharp. 3) Start rounding out the rest of the pan edge, curving the pan edge. 4) Repeat with the rest of the pan edges. 5) This is what the pan should look like when you're done. Now, lightly spray the pan with nonstick spray. 6) Roll out the dough between two sheets of plastic wrap. Split it into 3 equal squares and place each square in a shaped pan. Have the extra dough stick out inwards at the four points where the pie pan edges overlap. 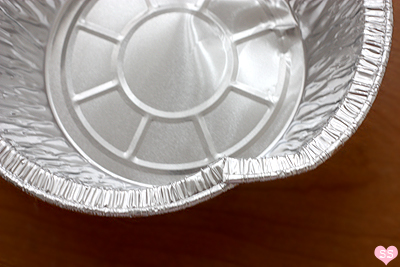 7) Take some foil and fold 12 little thick rectangles. Spray the rectangles with nonstick spray. Place each rectangle between the extra dough flaps on each crust. 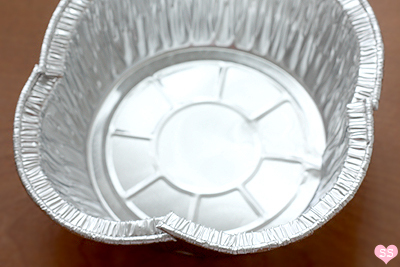 Press the dough into the bottom of each pan and around the foil rectangles. Take a fork and lightly prick the interior of each crust. Then use the fork tines to press into the top edge of the crusts. 8) Refrigerate the crusts for 10 minutes. Then, fill and bake. 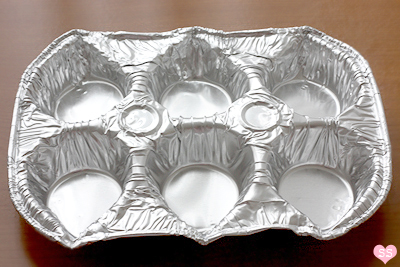 1) To shape the muffin tins, from the long side, pull on center of the edge of each muffin cup to a point. Crease side of the cup to emphasize the point (each cup should now look like a raindrop/petal). Lightly spray the two muffin tins. 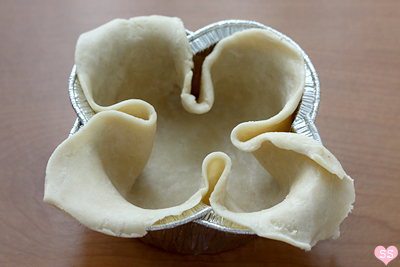 2) Roll out the pie crust dough between plastic wrap sheets and divide it into 12 squares. 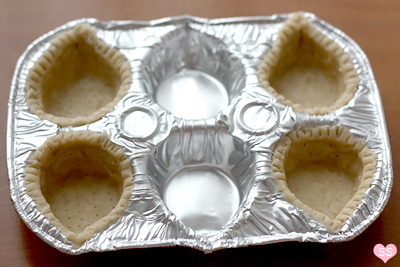 Place each dough square in a muffin cup. Press the dough into the muffin tins and trim off extra dough. Use a fork to lightly poke holes on the crust and use the fork tines to press along the top edge of each crust. 3) Refrigerate the lined trays for 10 minutes. Fill the crusts and bake. 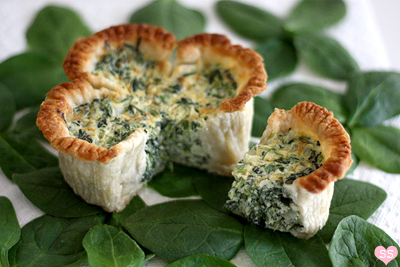 What a great way to transform a quiche into a cute shape! You always think of such nifty and creative ways to shape things! Genius!! What a simple + stunning idea! This is a great idea! Makes me wonder if the seperate molds would work for layered St Patricks day jellies?! Will need to go and experiment. I love it! I linked over from Be Different Act Normal. Your sidebar is filled with amazing things ... you have so much talent! That's so cool! What a fun thing to do for St. Patrick's Day! What a great idea! I love to make quiche. This looks like a fun way to make it. You could make all sorts of shapes for different holidays. I love your blog. I am your newest follower and can't wait to see more of your creative posts. I love what you've done with these quiches. Such a creative idea! They look delicious too. 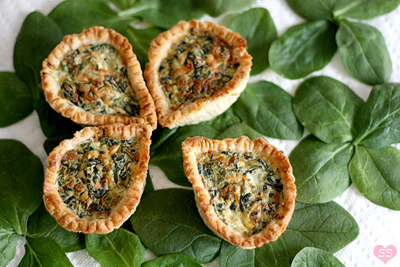 Besides tasting great these quiches are adorable, like everything else you do! crustabakes: Thank you! Haha, I'm always thinking that when I'm checking out FG or TS. "I wish I though of that. So simple!" Steph, Randi, Kat: Thank you! Lori: Most definitely. Imagine all the different shaped pies that can be made. Star shaped blueberry pie for the 4th of July, heart shaped jam tarts for V-Day, etc. tryityoumightlikeit: Thank you! Btw, I like your screen name. It's something I try to remind myself every once in a while. Chelsea: Thanks. Yup, for once I wanted to stick to a more natural form of green :P.
Laurel: I will check it out. How Cute! Might have to make these for breakfast tomorrow! Yumm! My St Patty's Day post was Double Chocolate Stout Cupcakes with Irish Cream Buttercream ...OH MY, HEAVENLY GOODNESS! Hey! I wanted to let you know that I'm featuring your quiche today. Thanks so much for sharing it. I'd love for you to stop by if you get a chance. That looks great! And thanks for posting it earlier enough to give us time to go get the ingredients before St Patrick's day! What a cute idea, my birthday is the 15th so I love all kinds of St. Patty's day stuff. I will definitely remember this recipe! HI! This is my first visit to your blog. Love it. Can't wait to read more. Love these quiche ideas! This is amazing! So glad I found this on your blog! 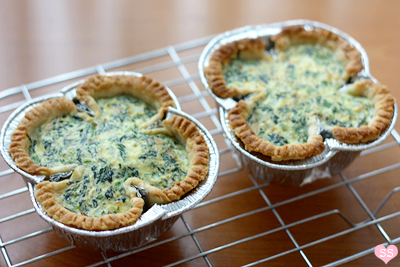 Erin: Quiche for breakfast? Yum. Oh and those cupcakes sound delicious! Katie: Thanks for featuring me! Megan: Haha, I was quite proud that I'm finally posting things up before the actual holiday. Christina: Birthday and St. Patrick's Day parties? Sounds fun :). Lea: Thanks for the award! I'll definitely check it out. 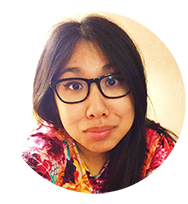 you can follow my blog! Jasmin Adili: Thanks! I will check it out. Haiyin: Hi fellow bio student (oh fungi, haha). I'm so glad to hear that you enjoy my blog. Thanks for the sweet comment. has anyone tried it without the onions... it sounds good, but my husband is allergic to garlic and onions and is really hard to find goods he can eat that is different then we normally eat. Feel free to leave out the onions. That's the great thing about quiche recipes: they're easily adaptable. Maybe instead sub a few crumbled slices of cooked bacon or some chopped up ham. As with many of my recipes, it's more about sharing a technique (in this case, altering a pan to a clover shape), so if you find another quiche recipe that's more to your needs, use that recipe instead along with the techniques I've presented in this post to make clover shaped quiche :). I LOVE this! I live in Clover SC and I am gonna use this for next Clover girls get together! Best Spinach Recipe For Saint Patrick’s Day. Mmmmm, I immediately scurried to the kitchen to see if I had ingredients & all but the gruyere are out there. 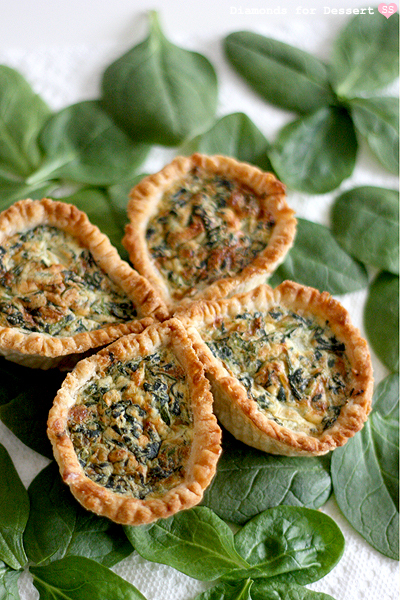 Tomorrow - Lucky Spinach Quiche at my house! This is the greatest! I love it! 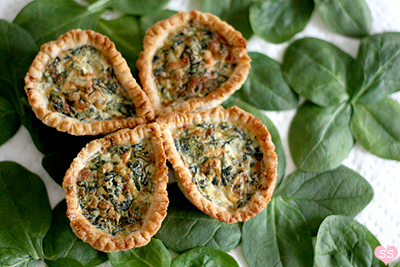 A St. Patrick's Day recipe that the whole family will enjoy! We have more St. Patrick's Day party ideas at Creative Party Themes. Have a great St. Paddy's Day! Such a great and fun idea. Just don't think I have the talent to do it. Sure looks yummy! I really want to try this but I have no working printer and hoped to post this on Facebook. Help!!! !